The iPhone XS Max has a 6.5in (16.5cm) display. The iPhone XS has the same 5.8in-sized component as the original. The iPhone XR's screen is 6.1in but is lower quality. That helped propel Apple to become the world's first company with a market capitalisation above $1tn (£768bn). The XS will match the original X's £999-£1,349 cost, while the XR will be £749-£899. 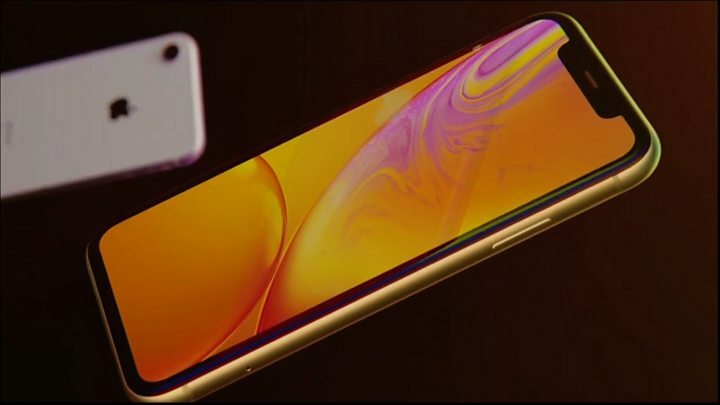 Apple highlighted that the iPhone XS Max's display was significantly larger than the 5.5in display of the old iPhone 8 Plus despite the two handsets being similar in size. 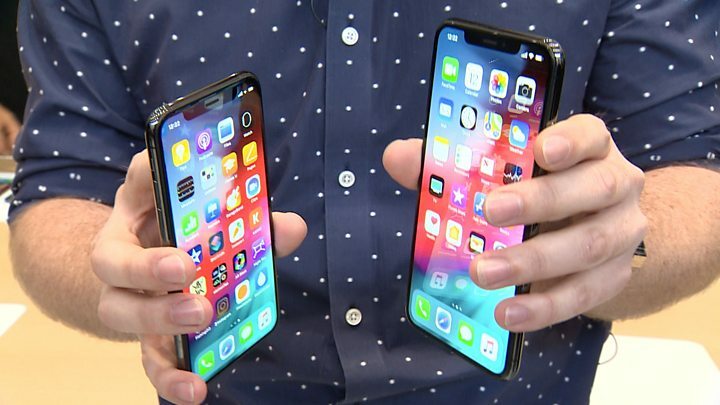 "Even if the screen on the iPhone X last year was larger some people who were on the Plus models missed the feel of a larger device which is exactly what the Max is addressing," said Carolina Milanesi, an analyst at the consultancy Creative Strategies. "Retention has become very high for both Android and iOS - switching is largely a thing of the past," suggested analysts at UBS. "Put simply, the replacement for iPhone is iPhone, the only question is when - and the when is driven in large part by form factor, namely the screen." The latest phones feature a fresh processor - the A12 Bionic. It is the firm's first to feature seven nanometre transistor technology, which should aid energy efficiency and computation speeds. Despite rumours that at least one of the new iPhones would feature three rear cameras - like Huawei's P20 Pro - Apple stuck with two 12 megapixel lenses for the XS and XS Max. The XR only has one rear camera. However, Apple did unveil a new feature that will allow users to alter the depth-of-field of their photos after they have been taken - effectively changing the degree to which the background is blurred. The XS and XS Max also introduce support for two mobile contracts - in most countries this will be via a physical Sim card in addition to an electronic eSim, which can be activated via a QR code among other means. "Apple will face some inevitable criticism that these products offer only small improvements on prior successes," said Ben Wood from the consultancy CCS Insight. "However, the fact that Apple has sold almost two billion iOS devices to date is testament to the success of the iPhone recipe since 2007." 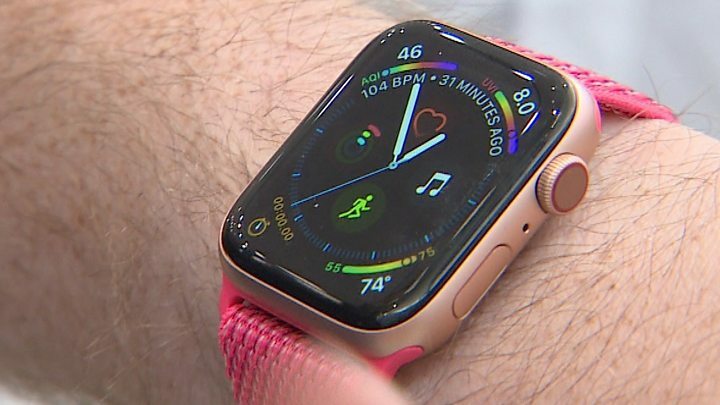 The firm said the Watch Series 4's usable screen was more than 30% larger despite the device itself having similar dimensions to its predecessor. Apple said the app that provides these functions had been given "De Novo" clearance by the Food and Drug Administration - meaning that it is recognised as being an entirely new category of product that can legally be marketed in the US as being capable of providing health readings safely and efficiently. "Getting FDA classification for health features on the new Watch underlines Apple's leadership in wrist-worn tech," commented Mr Wood. "It's an arduous process that no other consumer wearable company has successfully navigated." A new fall-detection facility also debuts thanks to the introduction of "next-generation" gyroscope and accelerometer sensors, which Apple said sampled data eight times faster than before. If the associated software believes the user has suffered a hard fall and remained immobile for a minute or more, it will send the emergency services an alert including the user's location, as well as contacting chosen friends or family if set to do so. Apple overtook Xiaomi and Fitbit to become the world's bestselling wearable tech company in the second half of 2017 thanks to strong demand for the last generation of its smartwatch. It has held on to the top spot ever since, according to IDC. "The reason it performed so well is that many network operators are only willing to focus on smartwatches with their own [built-in cellular] connectivity," said Mr Jeronimo. "That's why they are shipping about as many watches as the whole Swiss watch-making industry." Apple also confirmed that the next version of its mobile operating system - iOS 12 - will be released for existing devices on 17 September. Apple has never told us how many Apple Watches it has sold since the first device was released in 2015, other than to say it's the top-selling device in its category. Analysts, though, think sales are in the region of 50 million. Minuscule compared to the iPhone, but this is a device that's clearly on the up. It began life as a fitness device, but this update will, and this isn't marketing puff, help people stay alive. I haven't had a chance to try it yet, and one concern for me would be false positives - it thinking I've fallen over when I'm perfectly fine. And, if this is going to be marketed at elderly consumers, Apple's boast of packing the interface with more "complications" will make it, well, more complicated. But make no mistake. With US regulator approval - the first device of its kind to be given that clearance - insurance companies will be ordering these by the bucketload. It's not often a Silicon Valley company creates a product with the over-60s firmly in mind. Apple making a big leap into this market will make the Apple Watch, not the iPhone, the talking point of Apple's year. IBM Simon: The first mobile phone to offer a touchscreen user-interface - but its battery only lasted an hour. Siemens S10: The first handset with a colour display - although only red, green, blue and white could be shown. LG Prada: The handset debuted a capacitive touchscreen - detecting finger taps by changes in the display's electrical field rather than pressure. iPhone: Apple made use of "multi-touch", detecting several points of contact - allowing pinch-to-zoom and other interactions.